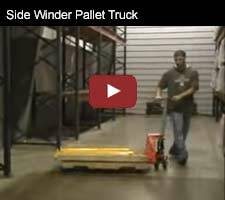 Transport long loads down narrow aisles with this heavy duty Sidewinder Pallet Jack. This versatile pallet jack retains all the quality workmanship of a standard pallet jack in addition to providing lateral movement. Simply place the forks into the pallet then elevate to approximately 7 inches, rotate handle and lock detent into place. The second set of rollers, right/left, are now actuated. Now push the Sidewinder perpendicular to the traditional direction. Service range: 3-1/2" x 8"
This monster jack can haul loads weighing up to 10,000 lbs. This is the only jack I have found that works well with long items loads like we have. This is a great specialty product that most people like me have needed but could never find. Very cool lift. Works great! These are nice to have when a single person needs to maneuver long products. We have a lighting company that requires us to stock and store lots of long aluminum extrusions. I have been looking a long time for something to move them by hand. We were using platform carts that always took 2 people and didn't fit through the smaller door areas. The minute I saw these I knew I found the product I was looking for. I am so glad I finally found these lifts. They are terrific!! 1 person can handle long loads without any hassle now. Cool idea!